Lily Katzman holds off a Rutgers defender. The sophomore midfielder and the Cats look to remain undefeated at home this weekend. After picking up a critical conference win against No. 19 Rutgers, Northwestern is set to face two Indiana-based opponents this weekend –– Indiana and Ball State. The No. 10 Wildcats (8-4, 3-1 Big Ten) come into Friday’s conference clash boasting an undefeated home record and catching the Big Ten bottom-feeding Hoosiers amid road woes. Indiana (5-7, 0-3) is just 1-5 away from Bloomington, with its last road win coming over a month ago. Coming off back-to-back wins against ranked opponents, NU will have to maintain its focus heading into the weekend before facing two sub-.500 programs. The Cats haven’t let that focus lapse this year, not yet dropping a game to a team outside the top 25. NU will look to avenge its 2-1 road loss to the Hoosiers in their only meeting last year. 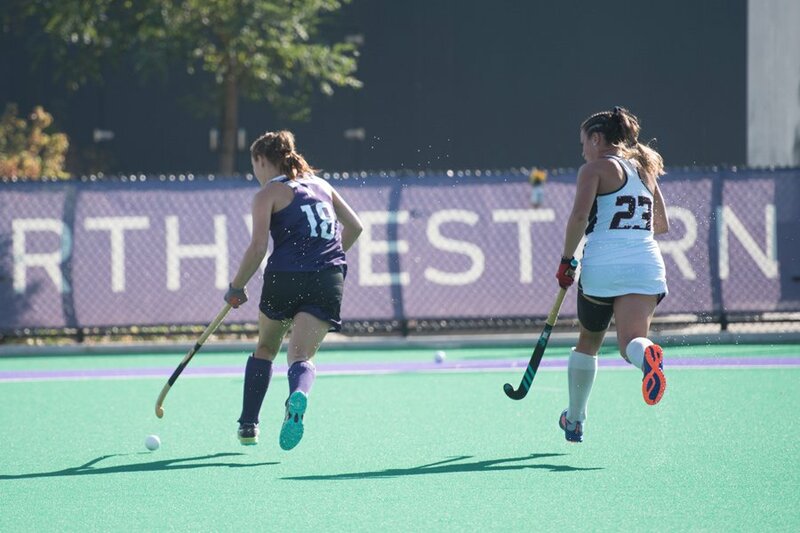 Sophomore midfielder Lily Katzman, who scored the lone goal against Indiana a season ago, said the team is better prepared to defeat the Hoosiers than in previous years. Pentenga will look to continue her stellar play after notching eight points in her last four games, including a key goal to start the scoring against the Scarlet Knights last Friday. Pentenga leads the Big Ten with 5.33 shots per game, while also sharing the top spot in the conference in assists. While Indiana is in the midst of its third-straight losing season, the Hoosiers have shown they have what it takes to knock off ranked opponents, defeating five top-25 teams in the past three years. Two of those five wins have come against NU, including last year when the Hoosiers took down the then-No. 6 Cats. With that history, NU is not overlooking Indiana this time around. While Indiana has shown the ability to take down top-flight competition, Ball State goes into Sunday its program in shambles. The Cardinals have played NU every season since 2010 and lost all seven of those matchups. Ball State hasn’t had a winning season since 2006, compiling a 61-158 record in the subsequent 11-plus seasons. Fresh off losses to No. 6 Michigan and No. 13 James Madison, the Cardinals will look to notch their first win against a ranked opponent in 12 years. But just because the opposition isn’t top-class doesn’t mean Fuchs and the Cats will be looking too far ahead.